Mix the butter and sugar together in a bowl until they are just combined. In a medium bowl, sift together the flour and salt, then add them to the butter-and-sugar mixture. Then add lightly beaten Egg. Mix on low speed until the dough starts to come together. Dump onto a surface dusted with flour and shape into a flat disk. 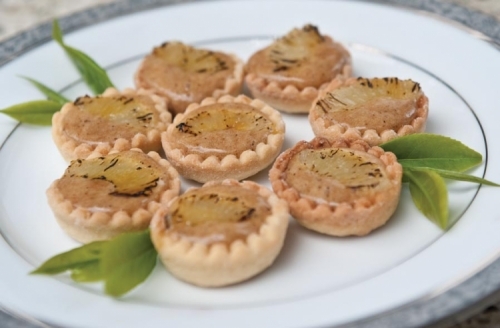 Press the dough into mini tart moulds and chill until firm. Meanwhile, preheat the oven to 160°C. Then bake for 10 minutes or until lightly browned. Allow to cool to room temperature. Pour the 80ml hot water to the Lemon & Lime Tea and brew for 15 minutes. Leave to cool. In a bowl placed over a pan of simmering water whisk together sugar, tea and eggs until cooked. Once Curd has become nice and thick remove from heat. Then pass through a fine strainer and stir in butter. Cover with a plastic wrap to prevent a skin from forming and refrigerate until use. Fill the tart shell with lemon curd and serve.